In toothpaste, Teflon, LEDs and medications, elemental fluorine shows its value, but it is highly toxic. Attempts to determine the crystal structure of solid fluorine using X-rays ended with explosions 50 years ago. A research team has now clarified the actual structure of the fluorine using neutrons from the Heinz Maier Leibnitz Research Neutron Source (FRM II). In the first attempt to determine the atomic distances of solid fluorine in 1968, a research team in the United States used X-rays. A difficult task, because fluorine only becomes solid at about minus 220 °C. And cooling down the aggressive element resulted in explosions. Nobel laureate Linus Pauling was sceptical about the results, and in 1970, proposed an alternative structural model without delivering the experimental proof. For 50 years, no other chemist ventured to take on the delicate task. Neutrons are particularly well suited for localizing fluorine atoms with high precision. 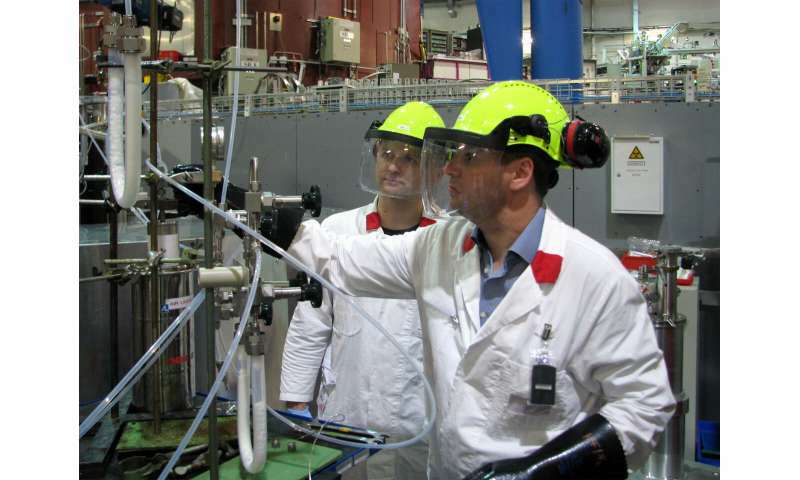 Since they can penetrate even thick-walled sample containers, neutrons provided the method of choice for Professor Florian Kraus and his team in Marburg. They used the powder diffractometer SPODI at the FRM II with TUM scientist Dr. Markus Hölzel and his colleagues. "Extremely precise measurements with neutrons are important to facilitate calculations for a wide variety of applications," says Florian Kraus. "For other elements, high-precision crystal structures have been available for years. The crystal structure of oxygen, for example, has been investigated 35 times and carbon 108 times."